She was born as Rosa Eluvathingal on October 17, 1877 in a Syro-Malabar Catholic Nasrani family in Kattoor, Thrissur near the city of Thrissur in Kerala. Rosa was the eldest child of wealthy landowner, Cherpukaran Antony and Kunjethy Eluvathingal. 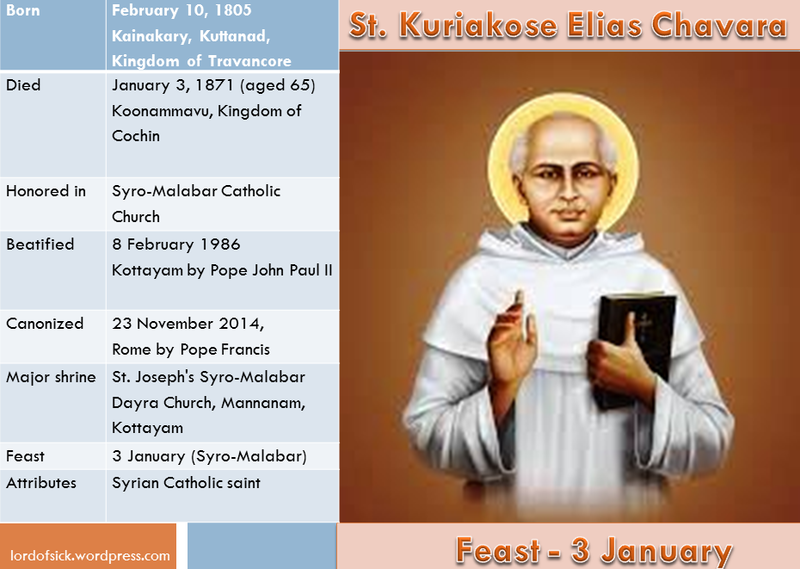 She was baptized on October 25, 1877 in the Mother of Carmel Church in Edathuruthy. Her mother was a devout Syrian Catholic, who taught her to pray the rosary and to participate in the Mass. At the age of nine, Rose is said to have experienced an apparition of the Blessed Virgin Mary, which led her to make a commitment never to marry, and to commit her entire life to God. As she grew older, Rose desired to enter the Sisters of the Mother of Carmel, who follow the Rule of the Third Order of the Discalced Carmelites. Her father opposed this as he wanted to arrange a marriage for her with the son of one of the other prosperous families in the region. Seeing her resolve, her father finally relented, and himself accompanied her to the convent. When she was ten, she entered the boarding school attached to the first indigenous Carmelite community in the Syro-Malabar Church, founded by Saint Kuriakose Elias Chavara and Leopold Beccaro 1866 at Koonammavu in Ernakulam District. In 1897, Mar John Menachery, the first native Bishop of Syro-Malabar Catholic Archeparchy of Thrissur, established a Carmelite Convent in Ambazakad (now belonging to the Syro-Malabar Catholic Eparchy of Irinjalakuda). 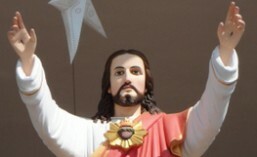 On May 9, he brought all five inmates from Koonammavu who belonged to his diocese. The next day Rosa was received as a postulant, taking the name Sister Euphrasia of the Sacred Heart of Jesus and was admitted to the novitiate of the congregation on January 10, 1898. The constant ill health she experienced, however, threatened her stay in the convent, as the superiors considered dismissing her. Euphrasia is said to have had a vision of the Holy Family, at which point the illness she had long felt ceased. 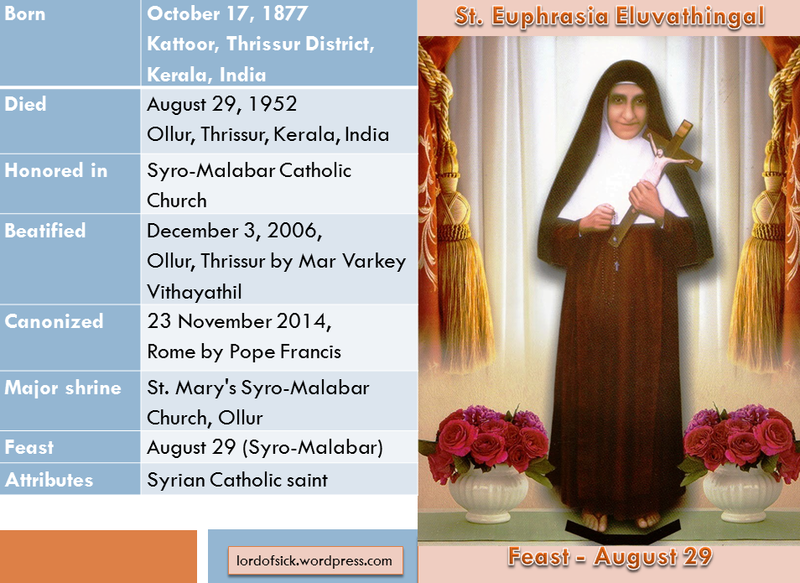 Euphrasia made her solemn profession on 24 May 1900, during the blessing of the newly founded St. Mary’s Convent, Ollur at Ollur or Chinna Roma. After she took her perpetual vows, she was appointed assistant to the Novice Mistress. Though frail in health, Euphrasia exhibited rare moral courage, and a very high sense of responsibility and in 1904 she was soon appointed Novice Mistress of the congregation in which position she worked for nine years. In 1913 she was made Mother Superior of St. Mary’s Convent, Ollur, where she was to live the rest of her life, serving as Mother Superior until 1916.